Volume is an important indicator in combination with price movements. 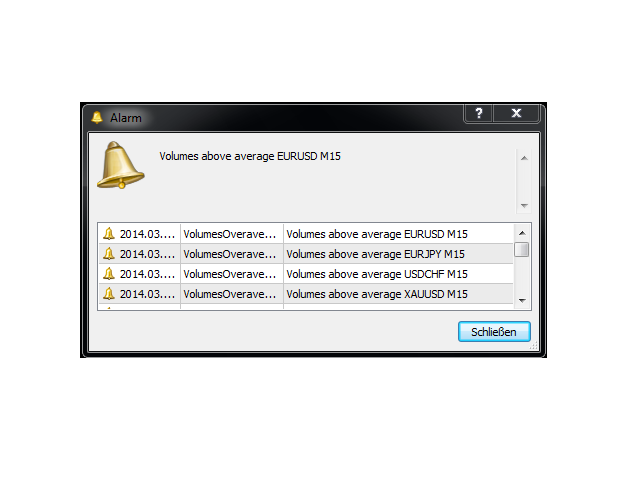 Volumes Overaverage Notifier informs you when activity is entering the market. This indicator is able to notify you via push notifications, alerts, sounds and emails when it is recognizing rising volume above a customizable level. 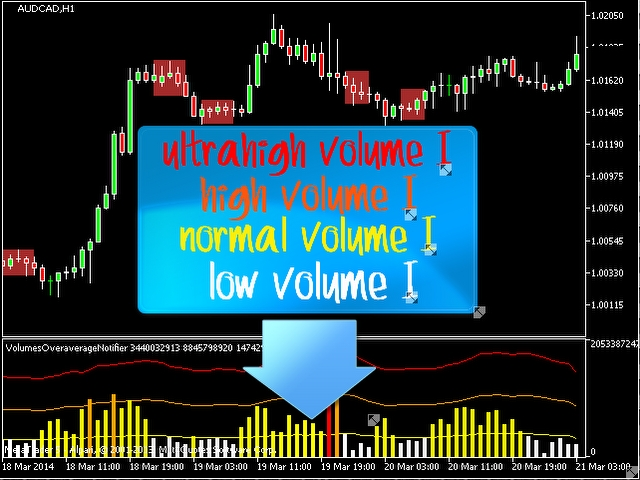 The volumes histogram is divided and colored in 4 different parts - low, normal, high and ultrahigh volume levels. Low volume zones are drawn as a rectangle into the chart. When volume enters the markets, it means activity. This indicator will help you to determine if the current price zone is made by lower or higher activity. As you can see in the screenshots, there is often a price movement next to the low volume zones. 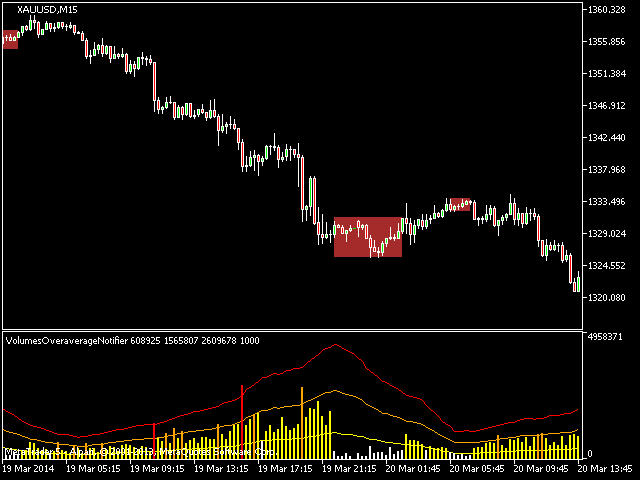 You can use the indicator on any pair and timeframe, change its volume settings and find your way to deal with it. The standard settings are recommended for M15 timeframe. Volumes - choose between real and tick volumes. MedianCalculationBars - number of volume bars for the median calculation. NormalVolumeFactor - set the median value to a custom level. 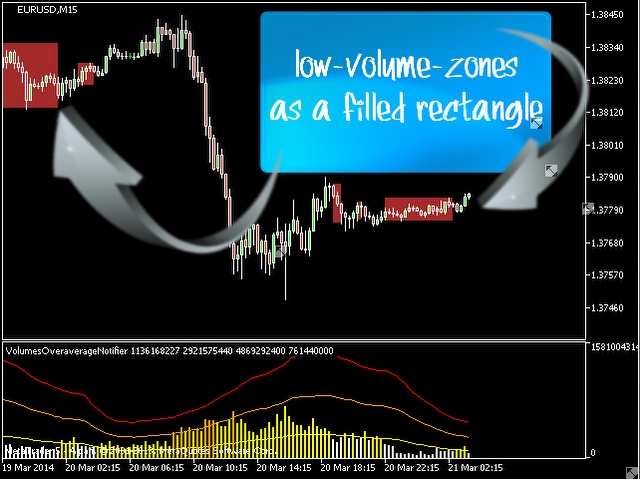 HighVolumeFactor - median multiplier to set the high volume zone. UltraHighVolumeFactor - multiplier to set the ultrahigh volume zone. NotificationMode - 0=disabled, 1=above normal, 2=above high, 3=above ultrahigh. SendEmailNotification - if true, the indicator sends an email if an account is configured. SendPushNotification - if true, the indicator sends a push notification to your configured ID. AlertAsNotification - if true, the indicator shows an alert in your running terminal. 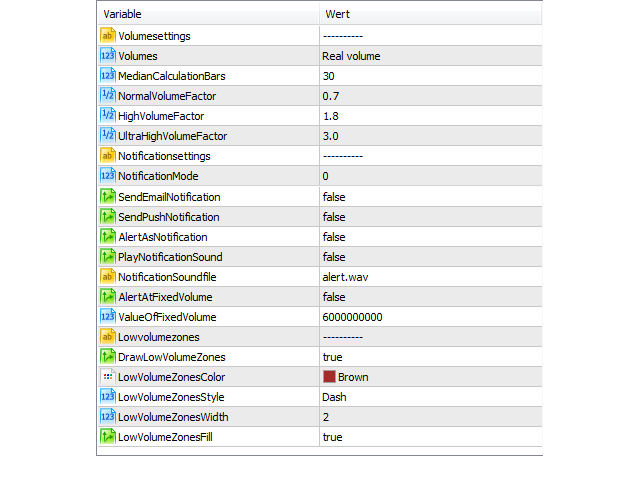 PlayNotificationSound - if true, the indicator plays a configured audio file. NotificationSoundfile - filename for PlayNotificationSound. AlertAtFixedVolume - if you want to get notified by reaching a custom level, this should be true. 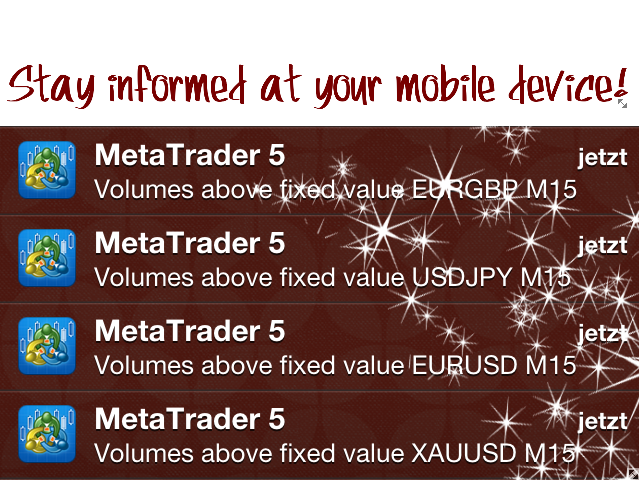 ValueOfFixedVolume - volume value to be exceeded. DrawLowVolumeZones - if true, the zones of low volume will be drawn into the chart. LowVolumeZonesColor - specifiy a color for the zones. LowVolumeZonesStyle - choose between Solid, Dash, Dot, Dashdot and Dashdotdot. LowVolumeZonesWidth - the width of the rectangles. LowVolumeZonesFill - if true, the zones are drawn as a filled rectangle.